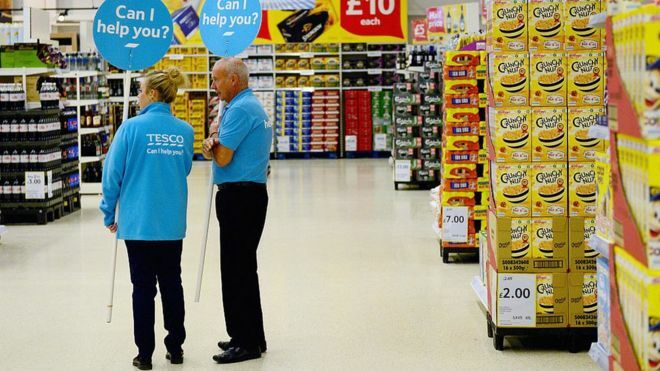 Hourly pay rates for Tesco store staff will rise by 10.5% over the next two years, the supermarket has said. But pay remains lower than at Aldi and Lidl and overtime pay on Sundays and Bank Holidays is being cut. Currently Tesco workers are paid £7.62 an hour, which will rise to £8.42 an hour by November 2018. 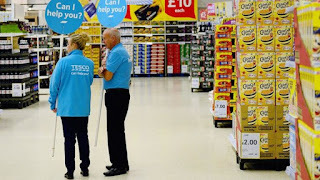 The pay rise will put Tesco workers' pay above the £7.90 level that the National Living Wage is expected to reach by 2018. The National Living Wage is the effective minimum wage for adults aged 25 and over, and is currently £7.50. Those under the age of 25 are entitled to a lower minimum wage rate, whilst workers in London receive a premium. Statutory minimum pay rates will continue to rise until at least 2020, according to recent government Budgets, and companies are planning for those changes, as well as striving to remain competitive with rivals in order to recruit and retain staff. Wage growth in the UK has been slow in recent years, but inflation has risen and other supermarkets have increased the wages they pay.